Hyundai has lifted the curtains off its 2013 Elantra Coupe along with the GT hatchback at the ongoing Chicago Motor Show in the United States. 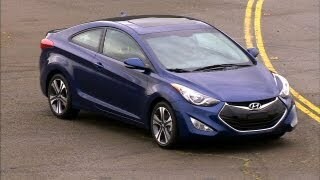 The 2013 Elantra coupe shares many similarities with the Elantra sedan, both on the inside as well as on the outside. The vehicle will hit the market by spring this year. One of the major similarities that the Elantra coupe shares with its sedan counterparts is the fact that it will be powered by the same engine as the Elntra sedan, which is the 1.8 liter four-cylinder D-CVVT engine with a peak power of 148 HP and a peak torque of 131 lb-ft. According to Hyundai, the car will have excellent fuel economy where it would deliver a fuel economy at the rate of 40mpg on the highways and 29mpg on city roads. 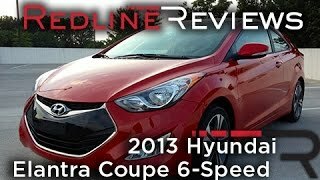 These numbers definitely gives the 2013 Elantra Coupe an edge over its rivals like the Kia Forte Koup and Honda Civic Coupe. As far as transmission is concerned, the Elantra coupe will have either a six-speed manual or a six-speed automatic transmission mated to its engine. The new Elantra coupe will be made available in two trim levels – base GS and Sporty SE. standard features like six airbags, a braking package and a stability and traction control system. On the inside the car will have features like a 7-inch touchscreen navigation system with rearview camera and USB and auxiliary ports. The price of this vehicle has not been announced yet by the company, but it is expected that they will do the same in the very near future. CHICAGO, Feb. 8, 2012 – Hyundai today introduced a new sport coupe variant to its industry-leading Elantra line-up at the 2012 Chicago Auto Show. This two-door coupe model of the Elantra sedan, available this spring, will attract even more buyers to the Elantra line-up, further expanding its appeal to savvy consumers. It offers many of the same attributes that made the sedan version a sales success, while broadening its market reach to youthful, sporty buyers willing to forgo four-door versatility for coupe design appeal. 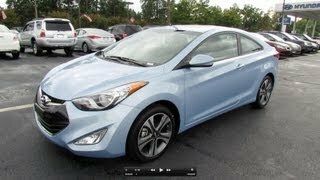 The 2013 Elantra Coupe marks the continuing evolution of Hyundai’s “Fluidic Sculpture” design theme with sporty design language, while assuming a compact coupe segment leadership position with an eco-efficient powertrain, generous convenience features, exceptional roominess and abundant safety features. Elantra Coupe is the latest vehicle in Hyundai’s 7/11 product initiative (seven new models in the next eleven months), following the Azera and Genesis Coupe. Why can’t a sporty coupe combine generous interior space with sleek design? Why pay premium coupe prices to get advanced safety and technology features? Why can’t a fun-to-drive sporty coupe offer 40-mpg fuel economy? Elantra Coupe takes Hyundai’s dynamic “Fluidic Sculpture” design principles to the next level. “Fluidic Sculpture” design language replicates the interaction of wind with rigid surfaces to create a perception of fluid in motion.Hyundai’s signature hexagonal front fascia opening and jeweled swept-back headlights give Elantra Coupe a lean, aggressive demeanor. Fog lights and available side mirror repeater lamps complement the view from the front. From the side, Elantra Coupe conveys a wedge-like sport coupe silhouette with deeply sculpted surfaces. SE model sporty five-spoke 17-inch alloy wheels with dark spoke inserts add a dynamic presence, while fast A- and C-pillar angles frame a sharply tapered greenhouse, further accentuating the wedge profile. Just below the belt line, a prominent character line carries from the door through to the rear deck. Wheel arch creases give a subtle flared appearance around front and rear wheels, for a wide and aggressive presence. Further, a beveled rocker panel rounds out the lean and muscular effect. From the rear, a blacked-out rear diffuser valance contrasts with dual chrome-tipped exhaust tips, and the SE model deck lid incorporates a lip spoiler design element. Under the hood, the Elantra Coupe is powered by the same 1.8-liter Nu four-cylinder engine with 148 horsepower (estimated) and 131 lb-ft of torque (estimated) found in the Elantra sedan (145 horsepower and 130 lb-ft of torque for Elantra Coupe PZEV). This high power-density 4-cylinder puts out a full six percent more horsepower than the Civic Coupe 1.8-liter. Thanks to advanced clean engine technology, most Elantra Coupes sold in California, Oregon and several Northeast states are certified as Partial Zero Emission Vehicles (PZEV) by the EPA. The PZEV Elantra Coupe is as clean as many hybrid electric vehicles, without the extra technological complexity and cost. The PZEV Elantra Coupe helps Hyundai meet and exceed its environmental requirements. Outside of these “green” states, the Elantra Coupe is available as an Ultra Low Emission Vehicle (ULEV). The Nu engine features an aluminum block with a cast-iron cylinder liner, cylinder head and crank. This unique configuration results in a block that is 30 percent lighter than an iron block, shedding more than 74 pounds of engine mass, while still providing equivalent strength. The 1.8-liter Nu also offers Dual Continuously Variable Valve Timing (D-CVVT) camshafts and hydraulic engine mounts for optimum power, efficiency and refinement. Using D-CVVT on both camshafts has several advantages when compared with using it just on the intake camshaft. These advantages include a two-percent improvement in performance (via increased volumetric efficiency), two-percent improvement in fuel economy (via reduced pumping losses) and a 30 percent reduction in hydrocarbon emissions. In the valvetrain, roller swing arms and hydraulic lash adjusters reduce valve-driven friction to improve fuel economy one percent compared with direct valve tappets. The Nu engine also features a maintenance-free silent timing chain to enhance durability and reduce noise, vibration and harshness (NVH). A plastic two-stage Variable Intake System (VIS) enables intake air to be directed between long and short intake manifolds, resulting in a broad, linear power band. This results in a four-percent improvement in performance, a 15 percent reduction in cost and 30 percent reduction in weight, when compared with aluminum. Another technology Hyundai engineers have incorporated into the Elantra Coupe is an electronic throttle control. Electronic throttle control replaces the conventional cable and mechanical linkage with instantaneous computerized control. This system accurately controls air intake and engine torque, improving drivability, response and fuel economy. To further improve fuel economy, Elantra Coupe applies double-pipe plumbing technology to the internal heat exchanger. Double-pipe plumbing improves cabin cooling efficiency, while minimizing compressor size, reducing fuel consumption. In addition, an externally-controlled variable compressor is used to improve fuel efficiency when compared with an internal variable compressor. The Nu four-cylinder engine also has an offset crankshaft design that reduces friction and pressure between the piston and cylinder wall for a one-percent improvement in fuel economy. Elantra Coupe’s fuel economy is estimated at 29 mpg city, 40 mpg highway for the six-speed manual transmission, and 28 mpg city, 39 mpg highway for the six-speed automatic transmission. These ratings give Elantra Coupe a highway-only driving range of up to 500 miles. The Elantra Coupe can be equipped with a six-speed manual (M6CF3-1) or automatic (A6GF1) transaxle with SHIFTRONIC® manual control. Hyundai now has in-house six-speed automatic transmissions in its small, medium and large FWD cars. Hyundai is also only one of four global car manufacturers building in-house unique six-speed automatic transmissions. The six-speed automatic is 11 pounds lighter than Hyundai’s global five-speed. It is considerably simpler, having 62 fewer parts, for greater durability, lighter weight and lower cost. It also features an ultra-flat torque converter that shortens the unit's overall length by 0.43 inches, while being 2.6 pounds lighter. This transmission, mated to the 1.8-liter Nu engine, helps Elantra Coupe deliver improved fuel efficiency – 11 percent more than its closest competitor, the Honda Civic Coupe. The Elantra Coupe’s six-speed manual transmission offers positive shift feel and further optimizes powertrain performance. Shifting performance is facilitated by durable triple-cone synchronizers for first and second gears, with double-cones for third gear and a single-cone for fourth, fifth and sixth gears. The Elantra Coupe rides on a 106.3-inch wheelbase, an overall length of 178.7 inches, 69.9-inch width, and 56.5 inch height for uncompromised headroom. Elantra’s total interior volume of 110.2 cubic feet exceeds the 2012 Honda Civic Coupe and 2012 Kia Forte Koup by large margins. The Coupe’s long wheelbase allows for compact coupe efficiency with class-above relative comfort levels. Elantra Coupe’s trunk volume at 14.8 cubic feet also beats Civic Coupe and Kia Forte. The Elantra Coupe is fitted with a McPherson strut front suspension, with coil springs and gas shock absorbers. The rear suspension is a lightweight coupled torsion beam rear design for enhanced steering stability and monotube shock absorbers for ride comfort and control. A substantial 22.0-mm diameter front stabilizer bar helps reduce body roll and turn-in response when cornering. Steering knuckle design, torsion beam rigidity and damper tuning have all been recalibrated for sportier handling and steering responsiveness compared with Elantra sedan. In addition, Elantra Coupe offers a sportier SE model suspension calibration that is optimized for its lower-profile P215/45R17 tire. All Elantra Coupes have column-mounted, motor-driven electric power steering (MDPS) that adjusts instantly to changing driving conditions while improving fuel economy over a hydraulic steering system. A quick-ratio steering rack is used for crisp feel on turn-in. World-class weight efficiency was a key program target for the Elantra Coupe engineering team. As a result, Elantra Coupe leads the Kia Koup in weight efficiency, while leading the Civic Coupe in power-to-weight ratio; both are key measures of overall powertrain and structural efficiency. High-strength steel in Elantra Coupe’s structure allows the suspension to work with precision in all driving conditions. This weight-efficient unibody architecture allows for Elantra Coupe to achieve an estimated 40-mpg EPA highway rating, without the need for a special eco model and its incremental costs. Inside the Elantra Coupe, customers will find Hyundai’s expertise in interior packaging, lighting, leading-edge design and craftsmanship. This approach is visible in gauge clarity and the tilt and telescopic steering wheel. Seat construction uses lightweight materials and environmentally-friendly foam for further benefits to fuel efficiency. 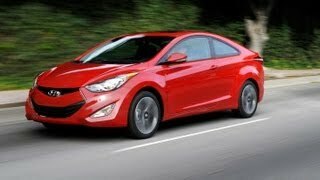 Elantra Coupe seat design also provides deeper side bolsters compared with Elantra sedan for sportier driving. Heated seats are standard equipment on all Elantra Coupes, while the SE model offers sporty aluminum pedals. The Elantra Coupe offers two interior color choices, gray and black, available with either the GS or SE trim. All Elantra Coupes have cloth-like pillar trim made of fibrous tissue and volcanic rock for a premium look, feel and minimal environmental impact. Elantra Coupe will offer seven exterior colors, three of which are unique from Elantra sedan color choices: Monaco White Black Noir Pearl and Volcanic Red. Elantra Coupe is available with two audio systems. Standard is a 172-watt AM/FM/Satellite Radio/CD/MP3 audio system with six-speakers and iPod®/USB/auxiliary input jacks. A 360-watt system with external amplifier is optional with the SE Technology package. Touch-screen navigation is available on SE trim and includes a high-resolution 7.0-inch screen and voice-activation by headliner-mounted microphone. The sound system plays compact discs, accesses digital music files via Bluetooth streaming audio or allows driver and passenger to access their personal listening devices through the iPod/USB/auxiliary inputs. Bluetooth audio wirelessly streams music from select mobile phones to the head unit. The XM Satellite Radio interface is also integrated into the navigation unit and features channel logos, real-time NavTraffic and XM Data services, such as XM NavWeather®, XM Stock Ticker and XM Sports Ticker. The system also integrates a rear-view camera, which cannot be found on the Honda Civic Coupe or Kia Koup. Users can even upload personal pictures from a USB rather than a CD to be displayed on the system’s home screen. Elantra Coupe owners can also get premium features, such as proximity key with push-button start, leather seating surfaces, heated front seats, power sunroof, and dual automatic temperature control with Clean Air Ionizer and auto-defogger. VSM works to control two effects. The first is when a driver accelerates or brakes on a split-mu surface (slippery on one side, dry pavement on the other) and the vehicle wants to pull in one direction. VSM detects this condition and sends a signal to the MDPS to apply steering assist. VSM counters the pull and automatically provides eight Newton meters of counter steering force. VSM reacts the same way during sudden lane changes or fast cornering. ESC is still not standard on the Civic Coupe. Elantra Coupe features six airbags—including dual front, front seat-mounted side-impact, and front and rear side curtain airbag. The Elantra Coupe also features a state-of-the-art braking package. The package includes four-wheel disc brakes and an Anti-Lock Braking System (ABS) including Brake Assist, which provides maximum braking force when a panic stop is detected, and Electronic Brake-force Distribution (EBD), to automatically adjust the braking force to front and rear axles based on vehicle loading conditions and driving dynamics. Elantra Coupe engineers even looked at something as simple as the parking brake for an integrated rear parking brake caliper for weight reduction.